In the Philippines, we get to eat Jollibee almost everyday if we want to. But if you are living abroad, thousand miles away like me, you'll miss this famous Filipino fast food chain. So the kid in me is very happy to get a taste of it again. Actually, this is my third time to eat in Jollibee in Riyadh. I just lost the first two pictures. I'm so careless sometimes. I rarely get a chance to taste Jollibee here 'coz there's no delivery at work and at home and we go to Batha (where Jollibee is located) once a month only. 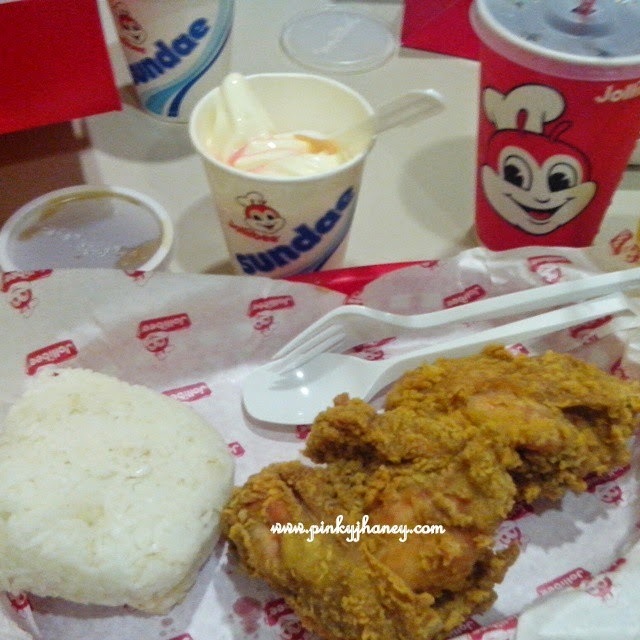 So even if there are other selection of Pinoy Restos around the area, we still opted to eat at Jollibee. We love Jollibee too kahit minsan nakakasawa na but my son loves their chicken joy. Nice to know that Jollibee is establishing more branches offshore. Buti na lang they have Jollibee here in Riyadh. I really miss Filipino food here. When I was in the Philippines, I got 'umay' with their chickenjoy. But now, I miss it a lot. LOL! Filipino overseas always miss Jollibee. There's something about Jollibee food that captures the taste buds and hearts of Pinoys. Jollibee is really 'tatak Pinoy.' Most Filipinos love eating here. Our all time favorite is Jollibee. They are continuously growing, even in abroad. It's good because there are many Pinoys abroad na so they will not missed eating chicken joy that much, hehe. It's really good they have branches abroad because once in a while, we still get to taste Jollibee even if we are away from home. My youngest daughter loves Chicken Joy. She wants to eat it every time we decide to eat outside. I think it's every child's favorite. My nieces and nephews like it, too. That was what I felt also when I was in the Philippines because everytime I go out with my nieces and nephews, it's always Jollibee that we go to. I get 'umay' with the food. But when I didn't eat Jollibee for more than 3 months, I missed the food. so now i want to eat chicken joy and spag! nainggit ako sa pic! That is great! I agree, talagang if you live abroad having jollibee feel so fancy and so good. I'm drooling right now. hahaha its been long time since I have Jollibee sobrang nakakmiss. Yum! Thanks :). Di talaga nakakasawa ang chickenjoy ng Jollibee.